I have had a number of good friends (non dog people) ask me why I do this and many are amazed at how wrapped up in this sport you can become. I try to spend no more than two weekends a month doing dog activities however the opportunity/addiction to do more is always there. As an owner handler in both conformation and agility it means I really have to pick and choose between events I will attend. 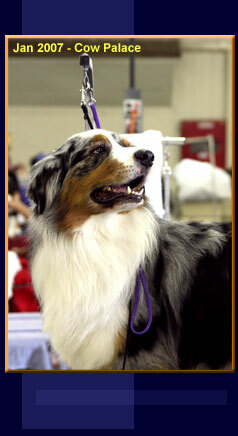 So I tend to limit myself to just AKC and ASCA events. Conformation is a lot more subjective with judges having complete control over the outcome! It is up to you the owner to have the dog in its best condition and the handler (in my case me) to be in the game and present the dog to the judge in their best light! Agility is more you and the dog getting through the course without any problems. Navigating your way through, making sure you keep bars up, nail those contacts and watch out for those sneaky traps. Judges acording to your class have courses ranging in difficulty. With agility you have to keep your dogs fit, yourself fit and train. I have found when I really work hard and train well the end results are nicer cleaner runs! "Run Fast... Run Clean..." is the name of the game.